Detailed Description: Watt Stopper Passive infrared line voltage occupancy sensor in white color operates up to 1200 sq.ft and accepts ballast/tungsten/LED loads of 0 - 800 Watts, 0 - 1200/0 - 1500 Watts ballast/LED loads. It uses the latest passive infrared technology and saves energy with walk-through mode while turning lights ON/OFF based on occupancy. Sensor provides 360 deg coverage for convenient operation and comes with auto set feature that automatically selects optimal time delay and sensitivity settings. It has a response time of 5 - 30 minutes. Sensor works with a supply voltage of 120/230/277/347 VAC at 50/60 Hz. 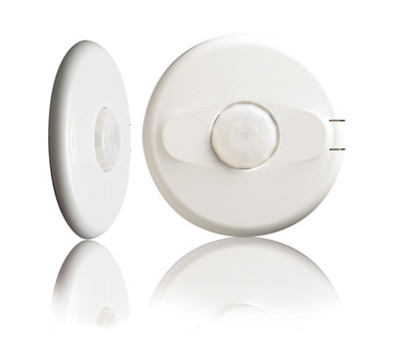 Sensor can be manually operated with a low-voltage switch input and comes with an LED to indicate occupancy and plastic housing gives a flat, self-effacing appearance with ceiling mounting. Sensor measures 4.500 Inch x 1.450 Inch x 4.500 Inch. It saves energy and allows easy installation with convenient connections. Sensor finds its application in open office spaces, computer rooms, conference rooms, classrooms and warehouses. Sensor is UL listed. Catalog Description This passive infrared (PIR) occupancy sensor 355 series automatically turns lighting on and off based on occupancy. The sensor mounts on the ceiling with a flat, low-profile appearance and provides 360 degrees of coverage.